Please help us test our new donations page (HERE), then share this request by e-mail and on (FACEBOOK HERE)...(TWITTER HERE) ... (ALIPAC HERE) . 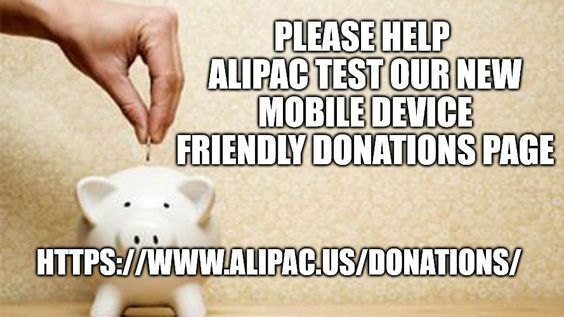 For many years our donations page at ALIPAC.us has not worked well on most mobile devices and this has been a big problem in a world where most of the people using the Internet now use smartphones, iPads, and tablets to navigate. Please help our efforts to fight illegal immigration and amnesty by testing our new page and then emailing WilliamG@alipac.us (Or replying to this email) with info about which device you used and how your experience went. As of today, our new donations page is ready for use and testing. While at the same link as before, our new page should 1. Allow you to easily use any mobile device to donate, and 2. Allow you the option of using PayPal, and PayPal processed credit and debit card contributions, OR use non-PayPal processed debit and credit card payments through @Pay. This is an important new step for us which we hope will greatly improve our national organization's fundraising abilities. It is also a step towards making all of www.ALIPAC.us more mobile device friendly to reach and influence more Americans like us! to let us know how the process went or if there were any problems. PS: Many of our supporters prefer not to use PayPal due to PayPal's support for left-wing causes and Amnesty for illegals. Please remember that setting up monthly donations of $5, $10, or $20 greatly enhances our ability to operate on your behalf on a national stage. Last edited by ALIPAC; 04-02-2019 at 05:30 PM.